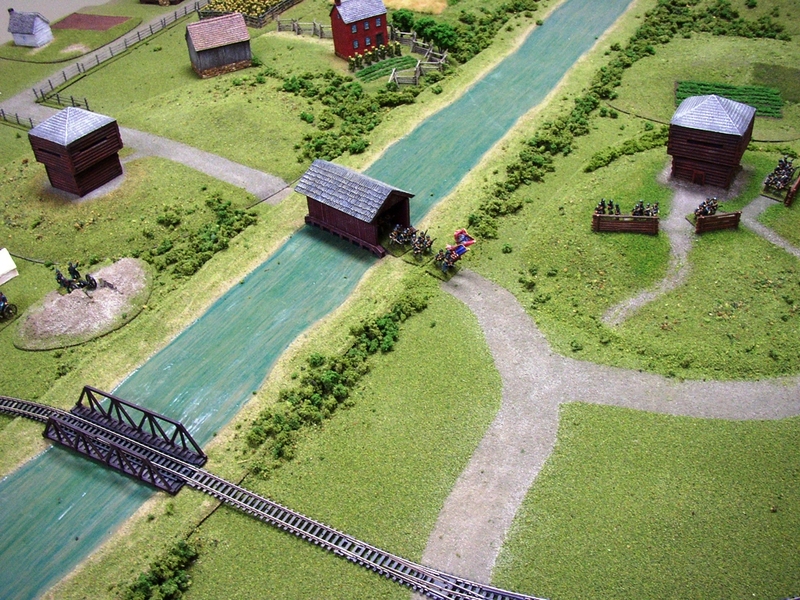 Two blockhouses (far left and far right of image) protect the old covered bridge and the B&O Railroad bridge at Monocacy Junction. 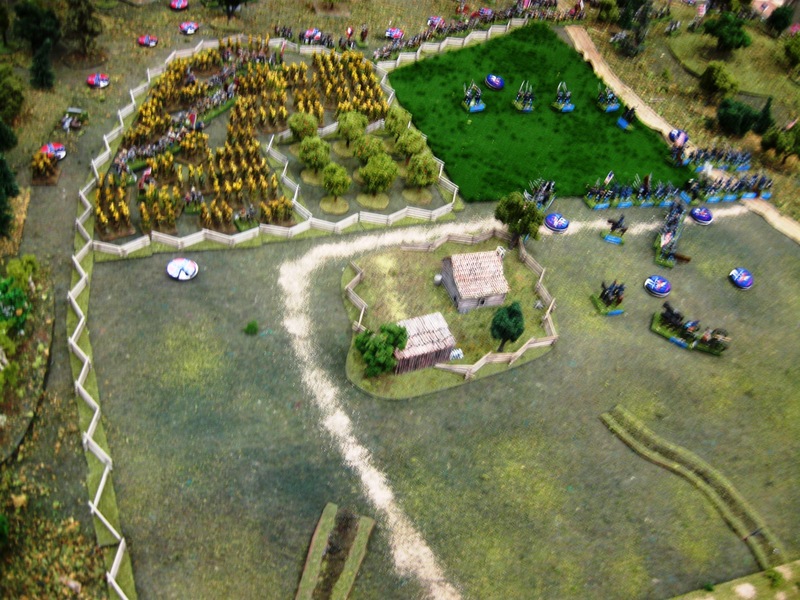 Veteran wargamer and master figure painter Larry Reber of www.gettysburgsoldiers.com sent me some photographs of a recent game he ran using a scenario I wrote for the July 1864 Battle of Monocacy (near Frederick, Maryland). This scenario appeared in Charge! 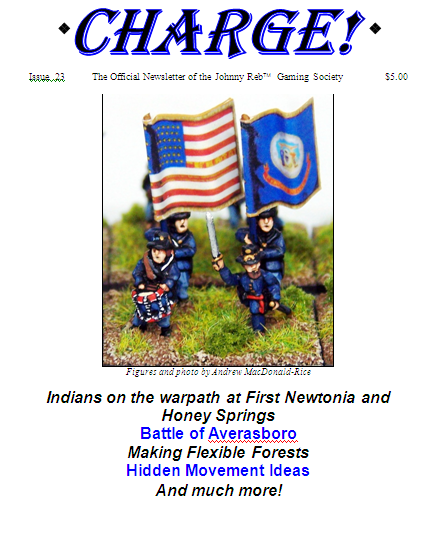 issue #25, and can be downloaded for a modest charge from the Wargame Vault. 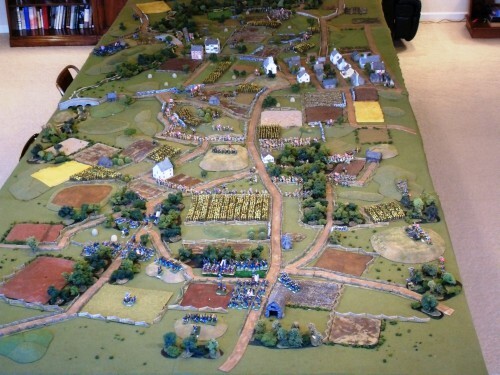 Larry will be presenting this impressive-looking Monocacy game at the upcoming Drums at the Rapids wargaming convention in northwestern Ohio. Here are the rest of Larry’s photographs! John Drewienkiewicz and Adam Poole have produced a fascinating and well illustrated new book on wargaming the American Civil War battle of Gettysburg. Volume 3 of the popular Wargaming in History series, this book carries on the tradition of the two earlier volumes in terms of quality of the photographs and the broad appeal of the content. 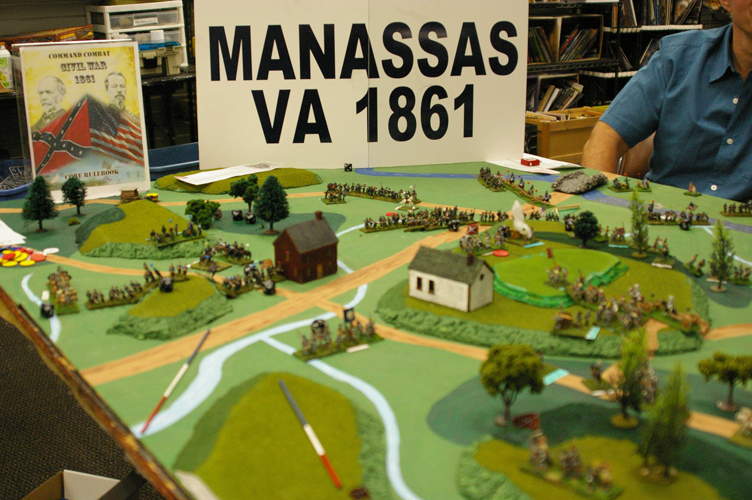 The authors and several others played a series of regimental-level wargames based upon the fighting at Brandy Station, Barlow’s Knoll, Sickles’ Folly, and Pickett’s Charge. They present a detailed after-action report replete with hand-drawn maps of the various troop movements, and describe the battle action and results in the text. Ken Trotman Publishing of Huntingdon, England, produced this book on high quality coated-two-side enamel paper with full color offset reproduction of the images and text. Priced at $50.0o U.S. , this book is a worthy addition to the gaming library. It is available in the U.S. from On Military Matters, 31 West Broad Street, Hopewell, N.J. 08525. In the UK, the book is carried by the publisher, Ken Trotman Ltd. (www.kentrotman.com). Here is a link to a very interesting on-line scenario for the July 1861 fighting along Bull Run near Manassas, Virginia. 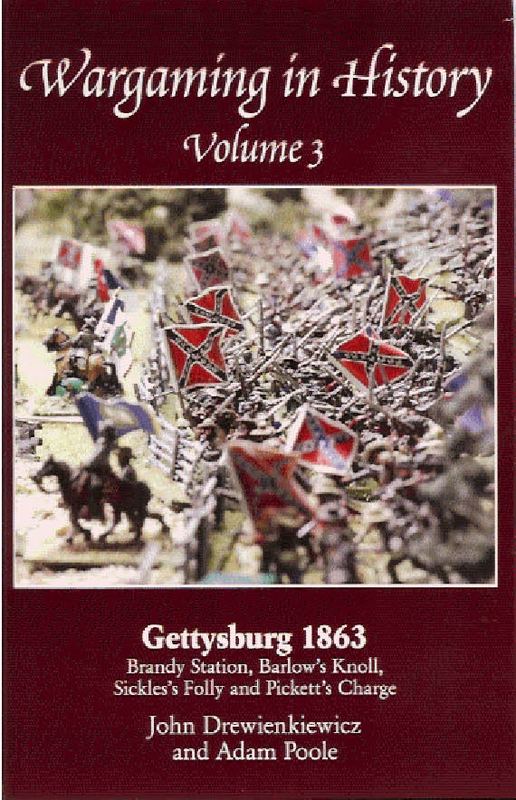 While written specifically for the Civil War Command rules set, this scenario should be adaptable for several other leading rules systems. This year marks the 150th anniversary of First Bull Run, a battle that stunned the North and gave hope to the South. It also showed the folly of promoting a brevet major in the adjutant’s office to brigadier general when that officer, Irvin McDowell, had little tactical or strategic field experience. McDowell would be replaced by the much more experienced George B. McClellan, who proved to be a strong trainer and organizer, but too cautious and indecisive on the battlefield. President Lincoln’s revolving door in the leadership of the Army of the Potomac would finally stop with George Gordon Meade in 1863 (and with U.S. Grant who traveled with that army in ’64-’65). For the South, the two principle leaders at First Manassas, P.G.T. Beauregard and Joseph Johnston, would go on to high profile, if not always successful, careers in the Confederate army. Johnston would be wounded in 1862 during the Peninsula Campaign, opening the way for Robert E. Lee. It’s interesting to compare the organization and order of battle at First Bull Run to that of the much larger opposing armies just a year later on the Peninsula. A handful of the generals are the same, and several colonels had been promoted. Of note is the massive increase in the size of the armies. Both sides had roughly 18,000 men engaged at Manassas; those numbers were substantially higher the rest of the war. 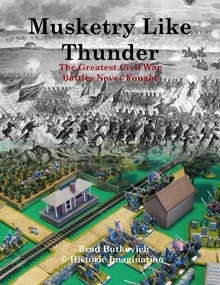 I have recently downloaded a digital copy of a new scenario book by Brad Butkovich in which he breaks down the 1863 battle of Chickamauga into bite-sized pieces similar to my books on Gettysburg and Antietam. 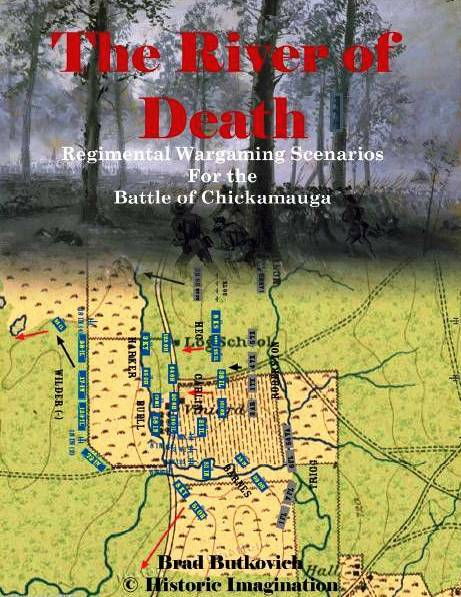 River of Death has more than a dozen original scenarios for Chickamauga that look highly playable. The scenarios should work for nearly all regimental-level ACW rules systems, including of course Johnny Reb 3 and Regimental Fire & Fury, as well as most others.